Over the 1954 Independence Day holiday, the attacks on the Girl Scouts spread to the US Congress, courtesy of B.J. Grigsby. Again, the Girl Scouts were accused of promoting communism and internationalism in the 1953 Intermediate handbook. Grigsby, a Chicago businessman, had read the LeFevre article and reprinted it in his own vanity newspaper, the Spoon River Journal. He also wrote to GSUSA expressing his concern over the new handbook and noting that he had contributed to the Girl Scouts in the past. The response from Leonard Lathrop, head of public relations at GSUSA, did not satisfy him, so Grigsby contacted his Congressmen. 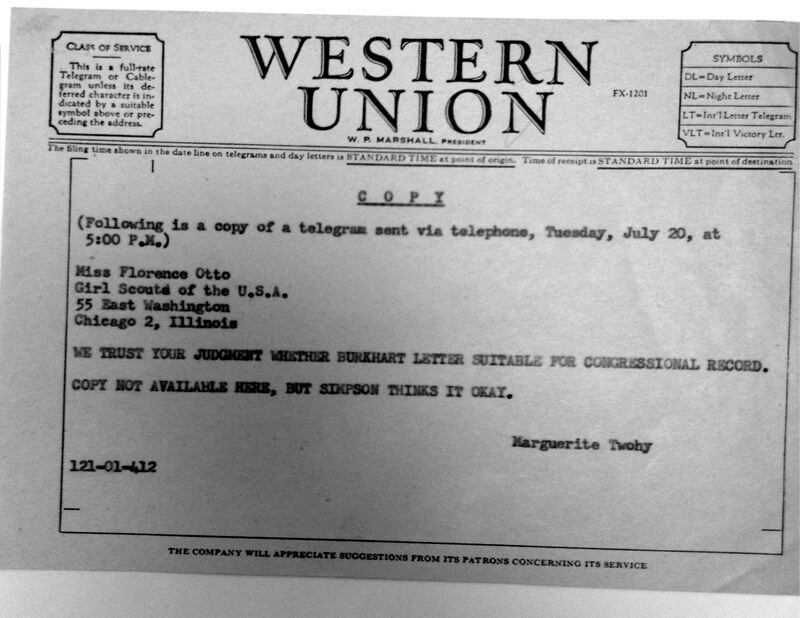 Ten days later, Illinois Congressman Edgar Jonas introduced Grigsby’s response to LeFevre into the Congressional Record. While Grigsby dismissed some of LeFevre’s charges, he agreed with others. Jonas also included Lathrop’s response to a letter of concern sent to GSUSA by Grigsby. What can communism really offer as it challenges all this? Nothing. What should Girl Scouts do to meet the challenge? Keep busy at our work of service with serenity of spirit. Try to attain the educated mind, the educated hands, the educated heart which will help us to keep our Girl Scout promise and prove ourselves assets to God, our country, and our fellow men. Girl Scouts try. Gilbreth’s article also ran in the October 1954 edition of Leader magazine. The tide began to swing in favor of the Girl Scouts, with Indiana Congressman Charles Brownson introducing a rebuttal from Indianapolis civic leader John Burkhart on July 26. The next day, Sheehan seemed to backtrack a bit and read into the Congressional Record a statement from GSUSA President Olivia Layton outlining revisions already underway. Discussion over submitting Burkhart letter to Congress. Another pro-Girl Scouts statement was made by Congressman Victor Wickersham of Oklahoma. In preparing this post today, I realized that I did not have a copy of his remarks. I searched the Washington Post online and, to my surprise, discovered that two years earlier, Wickersham had sold 20 acres of land to GSUSA for $30,000 — land that was used to enlarge the entrance to the Rockwood camp outside of Washington, DC. But, as it turned out, the skirmish on Capitol Hill was merely a lull before an even bigger storm. This entry was posted in Badges, Rockwood, Sensitive Issues and tagged communism, Congress, Girl Scout history, Girl Scouts, GSUSA, handbooks, Red Scare, Robert LeFevre, Rockwood. Bookmark the permalink.